Google Mail aka Gmail has been working on their email service since a long time and still weeks after weeks some new unique and exciting feature comes out. Sometimes those features are some sort of mods or sometimes the mail Gmail interface gets a luxury. Just like the Gmail’s multiple Inbox mod previously launched by Google Labs, this time Gmail introduced the multiple file attachments option. Before this the users will not able to attach more than one file at a time to the composed email. 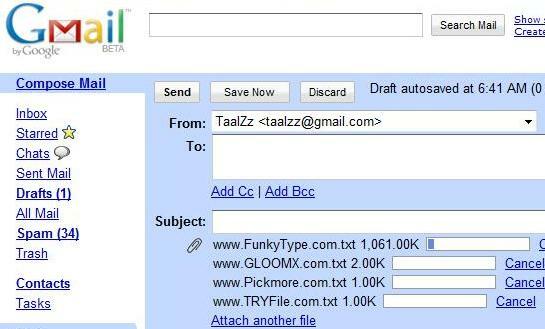 [ad#ad-taalz-inpost-left]By this new feature introduced by the Google team, users can just hold down the CTRL key while browsing the files and can select multiple files to be attached with the email. On the other hand the little change that I noticied is, the file is attached before you click the SEND button. Previously the files were just shown as attachments and when the user used to click the SEND button, those files were attached at that time. But now, I guess you will have to wait for the files to attach first and then you need to click the Send button.